I’m trying to remember the first time I had a Travaligni wine, it may have been just before or around the time the grapes for this wine were grown. I recall what I tasted (I wasn’t such an obsessive about keeping/writing notes, I just enjoyed it back then – and that’s where it began and ended. Previous to that experience, I’d passed by the Gattinara region, but I had no reason to stop, to consider the quality of the soils, etc., I was simply a tourist, driving some back roads, on the way to another big city. In 2014 I spent a week in the area. I came to know just how special those soils really are, how much the Supervolcano, and the other geologic factors have endowed the land with qualities and properties that are ideal for winegrowing. 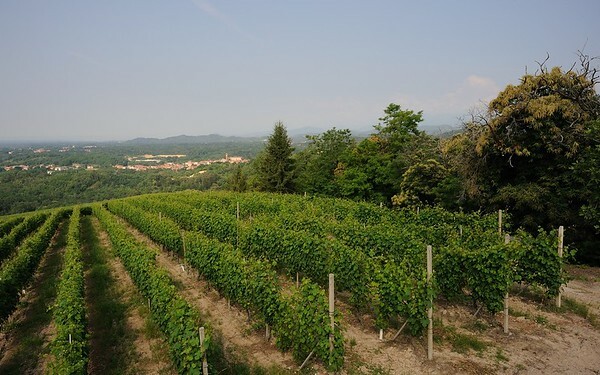 The Gattinara (DOCG) region itself is not much to look at, well, not if you’re a tourist in search of the next Duomo, Grand Canal, or Piazza, that is. If you’re a farmer passing by on the main road, well, you might look at it with an entirely different viewpoint, you might see what nature’s provided. Gattinara vineyards, Vallana property on top of the hill. Travalignin’s sites vary in altitude of 320-420 msl (from 1050 -> nearly 1400 ft), and have S/SW exposures. Travaligni’s Gattinara bottling, per their website, is best enjoyed 8-10 after release, so take the note on my 20 yr old example in that context. Vinification: (100% Nebbiolo) crushed and macerated for ~ 15 days in stainless steel tanks at controlled temperature. The wine is then aged for a total of 3 years, with 2 years in Slavonian oak casks of different origin and size; after, the bottles rest for 3 months prior to release. If you look at the map below, you’ll see the location of Travaligni. In the photo below that, for context, you’ll see the view from the vineyards toward the town of Gattinara in the distance. The vineyards are considerably higher (altitude) than the town below, the drive is fairly steep the entire way, the roads, mostly dirt, and very slow going. Considering that this bottle, per the producer’s website, is best consumed within 8-10 of release, and considering my bottle was nearly 20 years old, I’m very happy with the result, and the evocative Nebbiolo perfumes that were haunting and gorgeous. 3 January, 2018, 1998 Travaglini Gattinara – “Fill level, color and cork all in very good condition. The color is kind of a dusky ruby, it’s got a bit of rust;/tawny to it. Nose is actually gaining power – it was fairly subtle but pretty at first and now it’s a gaining vibrancy. Even more power with just five minutes in the glass; there’s nothing nothing off about this at all, my worries were unfounded. A lot of cinnamon, soil, dried roses, menthol, and muddled red berry fruit. There’s some freshness, and also a bit of maturity at the same time, it’s quite interesting this way. The wine is in fine shape on the nose, not quite as good on the palate; the lighter side of medium-bodied, the tannins are still somewhat noticeable, and the fruit has faded to the point that it needs to be consumed soon. Acids are holding fine but are dominating what little fruit remains. That said it should be a very good food wine tonight. It’s absolutely a joy to smell. I wouldn’t be surprised that if in the next hour or two the weight doubled, and this came more into balance. This is a pop and pour, and should be consumed now or the next couple of years. *After an hour, the nose and palate take a decidedly rustic, earth turn. And while it may bother some (most? ), I’m good with it; if nothing else, it’s amplifying the mushrooms in tonight’s dish; the perfumes are wonderful*”. 13,0% abv., drink now. For it’s age, this was really wonderful, in a mature, noble way.